Our vision is of a world where visually impaired young people enjoy the same opportunities and quality of life as those who are sighted. V.I.S.I.ON is a consortium bringing together partner organizations from Bulgaria, Italy, Luxembourg, the United Kingdom and Belgium, to learn and create as one European community. Working together, our consortium is collectively developing a participatory performance arts programme to develop the physical and vocal confidence of visually impaired young people, raising aspirations and promoting individual abilities. V.I.S.I.ON is creating of a method for "teaching self awareness and consciousness of the space around" with visually impaired young people through expressions of theatre and interactivity with the stage, music, nature and the city. We will be running drama workshops in our partner regions of Luxembourg, Italy, Bulgaria and the UK, and internationally, by bringing together all participants in Palermo, Italy, for a shared theatre experience. 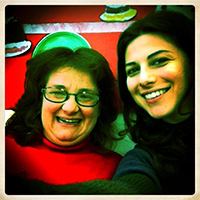 For young people, V.I.S.I.ON is about having fun and making new friends, and the project is open to all. Our workshops will include drama games, music and movement exercises. There is never any pressure to take part in activities and it is up to each individual how much they would like to participate. According to the results of the previous activity now the VISION program will be transferred on a wider scale. The method will be shared with the partners and the associated actors (theatres, schools and institutions) of the project to be disseminated and tested in different realities and countries. 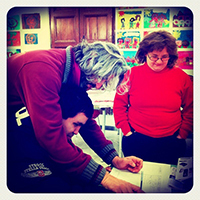 The method will be tested with a group of Visually Impaired children - 20 BG, 10 LUX, a minimum of 10 ITA and 5 Welsh - within a one month workshop, taking place during Fri-Sun period for about 3 hours daily, including a closing week in Palermo, for another confirmation of its applicability and adaptability both in a national and international dimension. The scheduling of the workshop will logically coincide with holidays in order for the children to be able to travel and enjoy the international part of the workshop in Palermo. During the pilot testing implemented in Palermo a staff training will take place, including practical activities and work with the children, brainstorming and discussion sessions. The last week of the international workshop, which will get the children together in Palermo and will be the peak of the activity ? one common multi-sense concerted training/peer learning action. During this activity the partners will identify and involve the target groups (both V.I. children and theatre experts and trainers) and will interview each individual for the purpose of outlining specific needs, which will help form the project and the training program. The children will also be asked about their English language skills. The project activities will be described to all parents and guardians, prior to any consent being given. In order to collect as much empirical experience as we can about the relationship between a young person with a visual impairment and theatre, the first step will focus on the past experiences of each partner, which will establish an introductory document in the form of a report. . This research will go further and gather empirical evidence on the importance of theatre in helping self-awareness and consciousness in visually impaired people. The research will be carried out by all partners except Inforef. All national reports will be collected and integrated into a comparative transnational report. On the basis of these reports the collection of practices and case studies (empirical evidence) will be summarised and organised online on the V.I.S.I.ON website. It will be the task of INFOREF to organise the database and create the website with the specifics, which are further explained in the respective activity. This activity deals with the selection of researchers addressing different points of view of living with a visual impairment: psychologists, tiflopedagogists (experts / educators, specialized in the field of visual impairment) + experts in theatrical techniques. The partners will identify the necessary experts and there will be a minimum of two experts from each typology involved in common activities from at least two different participating countries. The deliverable consists of a report made by the three typologies of experts involved in the project who will analyze the good practices provided in O1 and write further documents to be used as scientific pillars of the VISION training program. This activity refers to the creation of the training program as a structure and methodology starting from the reports that have been developed within the first two work packages. It will be developed by the collective efforts of the experts from the partner organisations; researchers with specific expertise (psychology, tiflopedagogists), theatre directors, and experts on the issues related to visual impairment. 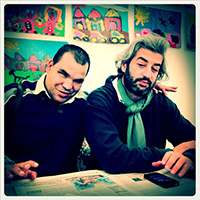 The pilot training program will be developed and tested (for one week - 5 working days) in Palermo by Music Arte and I Bohemiens with 10 visually impaired children in the Teatro Finocchiaro. Initial testing of the pilot program will take place on stage. Trainers all partner organizations will join the pilot testing. The experiences from the workshop will be recorded on videos by the organizers and Inforef and will then be edited by the Inforef experts. The final version will be uploaded onto the website and on the Youtube page of the project. After the method has been monitored and tested, a tangible document, explaining the activities (and their meaning) to be performed on the stage (also using music, street sounds, nature sounds and skin contacts) and the interaction between the director and the children, will be developed. It will be organized in the form of the structure and proposed contents of a “train the trainer” guide. This deliverable will be finalized after the workshops included in the exploitation activity. A number of videos showing moments from the pilot testing, the workshops and events, video tutorials, will be edited and subtitled by INFOREF. The translations of the texts are going to be provided by the respective partners. The experts involved in the implementation phase will be requested to record video tutorials with explanations of specific topics regarding the training program they have special expertise into. the "white" smiles promotional video showing the happy faces of the VISION group. The videos will be available to the media for broadcasting. They will be uploaded on the project web-site, on the project facebook page, on youtube. Five conferences with duration of one day will be organised in Palermo, Sofia, Veliko Tarnovo, Luxembourg city and Cardiff on the same date for presenting the project results. Each hosting member will be in charge of inviting members of public, authorities, associations of parents of visually impaired children, theatres, cultural organisations, decision and policy makers, etc. During the pilot testing implemented in Palermo a staff training event will take place, including practical activities and work with the children, mind mapping and discussion sessions. The last week of the international workshop will get the children together in Palermo and the peak of the activity will be one common multi-sense concerted training/peer learning action.